There were a lot of happy coffee drinkers and donut eaters on Friday. The grand opening of a new Dunkin Donuts in Columbus started at 5 AM. 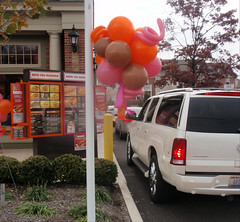 This is the first of at least thirty Dunkin Donuts opening in Central Ohio. The next opening will be (updated February 2009) Broad and High on February 11th and Bethel Road (updated May) in June or July. Dunkin Donuts expects to double the number of locations in the USA to 15,000+ by 2020. Many of us only know about Dunkin Donuts from older national commercials (“time to make the donuts”) and a few locations in Columbus over the years. There is a culture to Dunkin Donuts that we will see grow in Columbus. In New England there is an average of one Dunkin Donuts for every 5000 residents. I was in Chicago last week and there seemed to be a Dunkin Donuts on every block. There were more Dunkin signs than Starbucks….that is hard to concieve. On the east coast, especially Boston, people are die hard Dunkin Donuts coffee fans. Many New England transplants missed their DD. The wait ended yesterday as shown by a steady line of cars outside and people packed inside all morning. 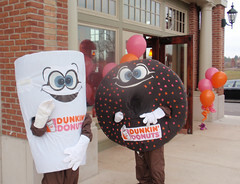 Dunkin Donuts also has a certain cool factor that will fuel the growth of loyal fans. The company’s ads poke good natured fun at Starbucks and sometimes feature They Might Be Giants songs. Dunkin has over 200,000 fans on Facebook. Keep an eye out for pink and orange DD magnets on the back of cars. There is a good chance the drivers are making a run to Dunkin Donuts. This entry was posted on November 8, 2008 at 8:52 AM	and is filed under beverages, breakfast, Columbus. Tagged: Dunkin Donuts Columbus. You can follow any responses to this entry through the RSS 2.0 feed. You can leave a response, or trackback from your own site. Thanks for the notice on this Jim. Since I come from the great Commonwealth of the home of the Kennedys, I am all over this. Meet your central Ohio Death Starbucks. Yay. I’m really looking forward to this – I’m not a huge fan of Krispy Kreme because glazed donuts get cloying after a while. I’m just glad I won’t have to drive up to 161 near Cleveland Ave whenever the mood strikes me anymore. Dunkin Donuts are kind of like Starbucks, in that they get credit for raising the bar for donuts across the board… and I’ll still go there once in a while when I have a real craving. But a small donut shop in central Illinois opened my eyes to the fact that donuts fresh out of the deep fryer are TOTALLY different than those that have been sitting for a while. If DD ever adopted Krispy Kreme’s method of selling donuts the moment they’ve been made, still hot out of the deep fryer rather than 12 hours old off the shelf… now THAT would be something. Dunkin’ Donuts actually raised the bar for coffee long bfore starbucks ever opoened its first shop. In fact, most of Dunkin’s sales are of coffee, and in the northeast it is like 75% coffee. Of course, the onuts ARE great, but the poster above that said c\Ohio’s Starbucks are in trouble is absolutely right. Bethel Rd? Anyone know the where and when of that location? Bethel not open yet. Located on south side of street just east of Godown Rd. (West of Kenny Rd) Been waiting for it.